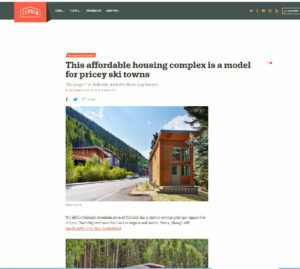 We were thrilled last week when Curbed covered our passion project, an affordable housing complex in Telluride, Colorado. 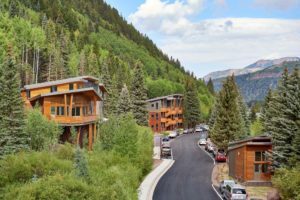 Virginia Placer includes a combination of communal living, tiny homes and apartment units; and was designed for the Telluride residents who are the backbone and soul of the town. Comprised of 18 apartment units, a 46-bed Boarding House and 3 Tiny Homes, the project accommodates a mix of incomes, individuals and families. According to Charles, it’s truly a labor of love. “When a community is stable (i.e. when people can afford to live there, even if it’s in subsidized),” explains Charles, “inhabitants on both ends of the financial spectrum benefit and thrive.” A balance was struck between affordability and sustainability with passive solar and ventilation, maintenance-free materials, and design in this new neighborhood a short walk from downtown Telluride. Read the entire article, here. This entry was posted in Featured, Industry News, Planning and tagged Affordable Housing, Architect in Colorado, Architect in Telluride, Aspen, boarding house, curbed, Curbed.com, mountain home, Telluride, Telluride architect, telluride home, telluride real estate, tiny home, vanlife, Virginia Placer. Bookmark the permalink.